Obviously Ludwig von Mises was the greatest economist of the 20th century – and, unfortunately, among the least influential when it comes to shaping the future of the the economics profession. Good thing that's about to change. 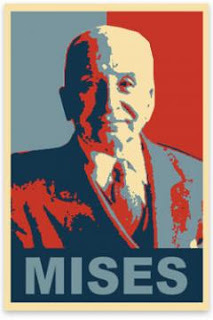 After all, we have the Mises Weekend podcast, we have the Mises Reader (both in limited and unabridged versions) and the The Quotable Mises. The set is now even closer to completion: I present to you, The Sassy Mises – the unofficial yet totally comprehensive collection of the best and most arrogant quotes and insults by Mises. In the highly unlikely event that some quote worthy of this list has been left out, you as a reader are obliged to provide me with it. Enjoy! All references are to the Scholar's edition of Human Action, unless otherwise stated. So, how come people believe and pursue inaccurate or mistaken ideologies or fields of study? A perfect ending to a great week at the Rothbard Graduate Seminar. Mises – my man! – is delivering. As always. These are excellent! What sort of cover design would be fitting for "The Sassy Mises"?